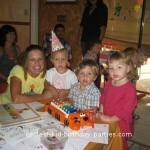 My daughter’s birthday is on Halloween. 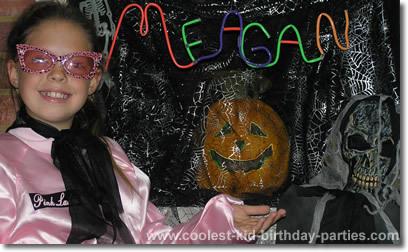 Every year we have a Halloween party and for invitations I write a poem about a little witch named Meagan. The poem (invite) continues each year. It is a poem about a witch who cast her spell to the past into the 1950’s. On the front of the invite I had pics of Meagan from the past 11 Halloweens. We sent candy bars to her friends at school in her 50s outfit with an invite on those. Well this past Halloween I made it a little different. 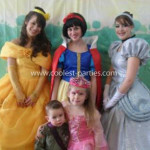 We wanted to get the grown ups to dress up too which has been difficult to get everyone to dress up each year. So we had a Halloween 50’s theme party. It was a theme I chose because it was simple for everyone to make up their costumes. 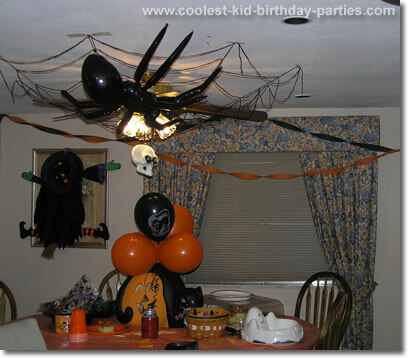 We bought cheap plastic black table cloth and hung it up all around the edges of the garage and made a haunted room for the kids to play all their games. We bought dry ice and put scary dummies in the corners. 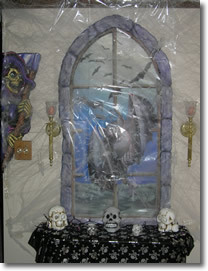 We then put fake tomb stones and spider webs through out the room. I put white sheets on all my living room furniture and decorated my dining room area. We played games with cooked spaghetti for guts and had the kids pull out prizes out of the monster’s guts. We also had a dummy wrap and a spider piñata. My family dressed up as Danny and Sandy from grease and Meagan and her girlfriends were the pink ladies. Her cake was a graveyard scene with an old 50’s car on it. 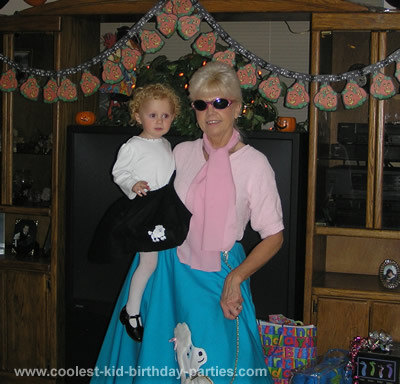 It was the best Halloween 50s theme party yet!